Situate your garden hose in a convenient location using the Panacea Basic Hose Stand with Brass Spigot. The sturdy, 1.5" x 1.5" metal post inserts into the soil virtually anywhere in your garden, while the attached black bib with front supports keeps your garden hose tidy and contained. A brass spigot beneath the bib brings water to the stand with ease. Connect an extra piece of garden hose to the back inlet, and connect the rest of the hose to the front spigot for a nearby water source. A handy knob at the top of the outlet turns the water on and off quickly, and the powder coated, black finish prevents the unit from rusting. Place this post in the ground for stability and wrap your hose around it when not in use. 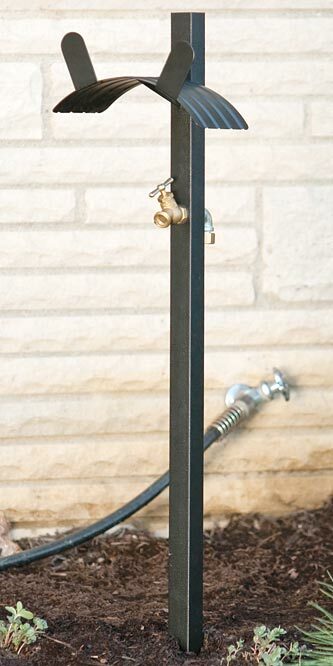 Keep your garden hose tidy and in a convenient spot with this Basic Hose Stand with Brass Spigot.